High quality and high yielding are the most desired cannabis plants by any cannabis grower. Pruning our beloved plants is a very important habit if we want to increase the ability of the plants to produce magnificent buds and promote their general health. The term “pruning” refers to any action that involves the removal of parts of the plant throughout its life cycle, such as leaves, branches and buds. The practice of pruning can be done in different ways, and each grower has his own preferences. What should be taken into consideration before pruning? 1.- Consider the whole picture before deciding to prune an autoflowering strain, as they have specific and short period of growth that does not allow the same margin of time for recovery as a photoperiod-dependent strain. If you want to limit the height, you can use the LST technique, allowing you to avoid the pruning of the main stem. 2.- It is advisable to learn and understand the function of pruning. One badly performed pruning can even trigger fungal infections in the plants. 3.- It is important to identify all the parts of the plant. When pruning, ignoring the difference between the main stem and the side branches can be a disaster. If you are a new grower, be patient, grow your plants by letting them develop naturally, and learn as much as possible throughout their life cycle. If you respect this process you will certainly be rewarded in the long term. When a cannabis plant grows naturally, without any human intervention, it usually develops a main cola (apical bud) that grows in the final upper part of the main stem, developing smaller shoots throughout the whole structure of the plant and its side branches. Most growers use different methods to shape the plants and achieve a better distribution of the buds, thus getting better results. 4.- When pruning, be sure to use sharp scissors and previously sterilize them with alcohol. This will help to create clean cuts and prevent undesired infections. We do not recommend using knives for pruning and you should never touch the plant directly with your hands in the zone where the pruning is performed. 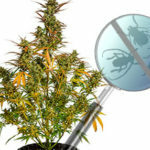 5.- Pruning is a task that can affect and stress cannabis plants. Therefore, it is better to prune and then leave a margin of recovery. It is recommended to keep at least one week between each pruning session. There are three main parts of the plant that can be pruned: leaves, side branches and small buds. The leaves within the areas close to the main stem in the cannabis plant must be removed to obtain a better distribution of energy to the buds. The yellow leaves that are about to fall can also be removed to have a better cleaning and hygiene in the plants and grow operation. But always avoid removing the main leaves (large leaves), as these help to provide better energy uptake for the plants. Sometimes, yellow leaves can also be a sign of nutrient deficiency, such as the classic lack of nitrogen, which should be treated with nutrients and special methods. It is important to keep this in mind, since plants often ‘talk’ to us through changes in color or in the shape of their leaves. If you observe and clearly see which leaves are about to fall, you can try to remove them and also improve circulation and hygiene in the grow operation. Cannabis plants develop their structure throughout the vegetative stage, producing small branches that grow out of the main stem. These can be removed to promote the growth of the main bud, but be careful not to cut the main stem! It is better to cut the small branches 1-2 weeks before the flowering stage begins. This technique is advisable for experienced growers. 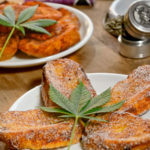 When harvesting the cannabis plants, growers often wonder what to do with the small, immature buds that grow through the branches. The answer is that they should have been eliminated as soon as possible once the flowering stage started. This is also recommended for more experienced growers who can detect and decide in advance which buds will end up with a shorter size. Next, we will talk about the different types of pruning and some of the best known and most efficient techniques for cannabis growing. All these prunings and techniques will have a very positive impact in the development of robust and vigorous plants, while also controlling the height of the plants and, most importantly, allowing for a greater yield. The apical pruning is very widely used, both in indoor and outdoor growing. 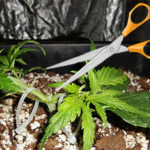 It consists of cutting the main stem of the cannabis plant to prevent it from growing vertically, and also to stimulate the production of more side branches so that the final yield can be maximized. To correctly perform this pruning, it is advisable to wait until the plant has at least 3 sets of branches, so that it can withstand the stress caused by the pruning. The cut should be as clean as possible, just above the last two arms of the branch. The result can then be observed and it should look like a main stem divided right in two, presenting the shape of an Y. This pruning is very similar to the Apical pruning. The grower also has to cut the main stem, but the difference is that instead of cutting only the main stem, the grower also has to cut the new shoot that is emerging from the top of the main stem, leaving only about 20% of the shoot. This will promote the development of more shoots from the same bud. The purpose of this pruning is to concentrate the production of buds on the top part of the cannabis plant. Lollypop pruning is performed by eliminating the small secondary branches that develop in the lower side branches of the plant. This will allow the plant to use all the available energy and nutrients in the upper part of the plant. This technique should be considered as an option especially for humid climates since it helps promoting air circulation through the plants. The pruning of low branches is usually done in several pruning sessions and often goes together with the use of LST, Scrog and SOG methods to shape the plant in a particular way. Cannabis plants tend to send most of their resources to its upper parts. That being said, with the LST technique, we manage to “cheat” our plants by guiding their branches to increase production, controlling their height and getting vigorous and robust plants. LST can be performed both in indoor and outdoor grows. You can use this technique throughout the entire growth cycle of the plant. LST should be performed within the 2-3 weeks previous to flowering, when the stems are more tender and flexible. You just need something to hold the stems (small ropes, fine wire, etc.) and treat your plant with great care. With this method the grower notoriously changes the natural form of the cannabis plant. SCROG comes from Screen Of Green and it is a technique that consists of placing a mesh or net over our cannabis plants and distributing their branches within the holes of the net, forcing them to grow underneath. With this, all the leaves, branches and new sprouts can grow at the same horizontal level. The most important advantage of the SCROG technique is that all the shoots will be at the same distance to the lamp, preventing them from generating shadows between each other. In addition, with a SCROG it is easy to get more production from our beloved cannabis plants. The SOG growing technique (Sea of Green) is used to maximize production in indoor grow operations. The purpose of this technique is to harvest quicker and get the highest yield possible, saving energy and being able to perform more grow operations along the year. With SOG we will work with a greater number of cannabis plants, which will present a smaller size than usual.